Reckless handouts are already destabilizing the economy and jeopardizing opportunities, long-term effects will be more devastating. Traffic in Thailand, particularly in the capital of Bangkok, is notorious. Jams can last hours, and what would normally be a 15 minute drive - during rush hours can last an eternity. In addition to mere logistical concerns, there is also the issue of pollution. Trapped exhaust floating above roads creates a visible cloud that impairs breathing and demonstrably affects the health of people who are exposed to it on a regular basis, including traffic police, motorcycle drivers, city residents, and pedestrians. A competent government would most likely work on reducing this problem along several approaches. 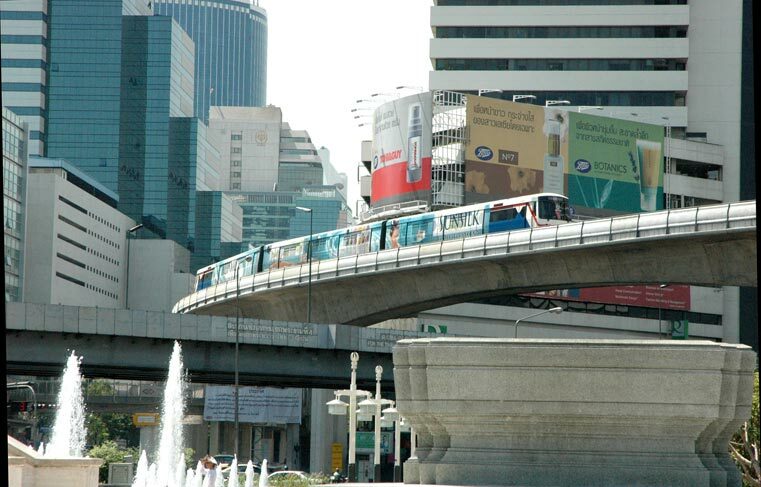 Image: Bangkok's elevated "Sky Train." Instead of handing out tax rebates for new cars, the government should be investing in expanding mass transportation beyond already long-signed contracts. The government's tax scheme is simply a shortsighted way to buy off votes, that will have a catastrophic impact on Thailand's future as reckless populism takes the place of proper planning. These approaches might include expanding mass transportation while increasing taxes on the purchase of new cars. Thailand already has many ways of getting around without the need for a car - in Bangkok, and even in the outlying provinces. Expanding and improving these options would greatly improve the lives of tens of millions of Thai people, as well as enhance their economy. Many might guess the current government, symbolically run by Yingluck Shinawatra, holding the premiership for her deposed, exiled, and convicted criminal brother, Thaksin Shinawatra, is attempting, but simply failing to pursue one of these approaches to solve this problem. But they would have guessed wrong. Instead of expanding mass transportation beyond what has already been long-planned, or imposing a tax on new car purchases to encourage people to use mass transportation, the government has actually implemented a " first-time car buyer tax rebate scheme" to encourage an increase in car purchases. Bangkok Post reports in their article, "300,000 claim new car tax rebate," that indeed, some 300,000 cars have been purchased under this scheme and is expected to deprive Thailand of approximately 30 billion baht in potential tax revenue in just one year - enough to extend mass transit elevated trains by many kilometers. The policy implemented by the current government aims at achieving two goals - first, a short-term buy-off of voters, in the hopes that most of Thailand's population will not understand the reckless, shortsighted nature of the policy and how it will only compound chronic, costly problems already faced by the nation. Second, it hopes to benefit the multinational corporate-financiers that have stalwartly backed Thaksin for over a decade. Other reckless policies aimed at achieving short-term popularity at the cost of long-term development and stability include similar house-buying schemes, rice-buying schemes where the government has been stockpiling warehouses full of overpriced rice it has allegedly bought off from farmers, and the purchasing of tablet computers for first graders - even as school buildings crumble and the quality of instruction continues to plummet. For the price of buying off voters and maintaining a strong support base, the current government run by Thaksin Shinwatra via his own sister acting as his nepotist proxy endangers both Thailand's infrastructure and the future stability of its economy. Mass transportation must be expanded, and the 30 billion baht a year being lost due to the populist "new car tax rebate" scheme should be used toward this instead. The millions of baht wasted on handing out tablet computers to first graders who will lose them, steal them, abuse them, and if all else fails, find them obsolete by the end of the year, should be used to improve the quality of education and/or invested in more useful infrastructure like proper computer labs used to teach programming, design, and other IT-related skills. Similarly, the rice-buying scheme should be replaced with programs that help farmers diversify their economic activity and allow them to make money across a wide variety of markets beyond merely rice. That way, when rice prices fall, adequate income can still be made with other activities. Providing technical educations as well as introducing and leveraging modern manufacturing technology could accomplish this, and with government organization and funding, it can be done at an accelerated rate. However, these are big ideas, requiring effort and the prerequisites of a full understanding of how infrastructure and economies work. The message of "cheap cars," "guaranteed prices for rice," and "free computers," is much more appealing and easier to communicate than improved curriculum, diversifying economic activity at the grassroots, wealth redistribution through education and local entrepreneurship, and improving transportation through large infrastructure projects. The second goal of this policy is to directly benefit multinational corporate-financiers. Car manufacturers and the petroleum industry are undoubtedly thrilled with the news of 300,000 new cars taking to Thailand's roads. Thaksin's populist handouts have deprived the state of revenue to help multinational car manufacturers maintain their absurd and unsustainable business models. Computer manufacturers in China are likewise thrilled by the Thai government's decision to throw free computers at students instead of a quality education. The rice-buying scheme trills large mill owners processing and reselling rice to the government for absurd prices. 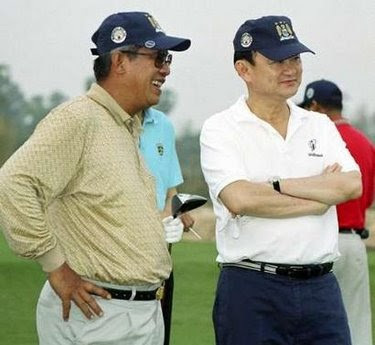 Thaksin (right), golfs with president for life Hun Sen of Cambodia (left). Many of these multinational corporations constitute the foreign support base that has been backing Thaksin for over a decade. This includes the US-ASEAN Business Council, who in 2004, Thaksin attempted to ramrod through a US-Thailand Free-Trade Agreement (FTA) for, without parliamentary approval. It was backed by the US-ASEAN Business Council who just before last year's 2011 elections that saw Thaksin's sister Yingluck Shinawatra brought into power, hosted the leaders of Thaksin’s "red shirt" street front, to provide undisclosed support ahead of the elections. In the end, the regular people swindled with bread and circus will find themselves again hungry tomorrow, and because of gross mismanagement and unsustainable, populist handouts, the free bread might not even be available to slake that inevitable hunger. The government of Thaksin Shinawatra hopes to consolidate its hold over Thai politics, industry, and society before that happens, and like neighboring Cambodia, where "President for life" Hun Sen has likewise eliminated all meaningful opposition, use his security forces to suppress his people and sell the land right out from under them. A responsible government that truly cared about the people would take the time to explain why quick fixes won't work and why more sustainable, pragmatic solutions should be pursued instead. Those throwing handouts to the masses, seek only to manipulate and use them in a quest to consolidate and maintain power. Once that power is consolidated, they will no longer need the people. The handouts will disappear, and the sustainable, functioning infrastructure necessary to maintain progress and modern civilization will not have been put in place to begin with. 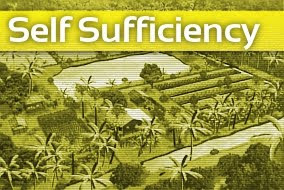 It is clear that there are no "responsible" parties in Thai government, therefore the drive for building sustainable infrastructure, improving education, diversifying economic activities, and achieving wealth redistribution not through handouts, but through local entrepreneurship must be a challenge taken up by the people themselves, through the development of local institutions, self-sufficiency, and by pragmatic local collaboration, not political struggle. Government: Parliamentary system, Unitary state, Constitutional monarchy.